Who should not take Zepatier? What conditions does Zepatier treat? List Zepatier side effects by likelihood and severity. Before using this product, tell your doctor or pharmacist your medical history, especially of: other liver problems (such as hepatitis B), HIV infection. What should I know regarding pregnancy, nursing and administering Zepatier to children or the elderly? This medication can slow down the removal of other medications from your body, which may affect how they work. Examples of affected drugs include certain "statin" cholesterol drugs (such as atorvastatin, rosuvastatin), among others. Does Zepatier interact with other medications? If you miss a dose, take it as soon as you remember. If it is 8 hours or less until the next dose, skip themissed dose. Take your next dose at the regular time. Do not double the dose to catch up. 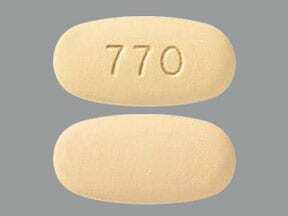 This medicine is a beige, oval, film-coated, tablet imprinted with "770". Are you considering switching to Zepatier? How long have you been taking Zepatier?